A huge downpour in Barcelona before and during the entire game gave the surface at the RCDE Stadium a greasy top, ensuring that tackles had to be expertly timed, and passes accurate. Both sides appeared to cope well in the opening exchanges under the circumstances. Barça’s passing game was quickly in evidence and the visitors were content to switch play from side to side. Without Lionel Messi from the start, Paco Alcácer was heavily involved, and the striker just failed to connect with a presentable chance before the quarter hour. Philippe Coutinho, back at the club where he spent an earlier part of his career, almost broke the deadlock with an exquisite curled effort which crashed back off of the crossbar, and shortly after, Marc-Andre ter Stegen was equal to a long-range shot from Leo Baptistao, as Los Periquitos attempted to get a foothold in a game that remained goalless at the break. Standing water, particularly in the central areas, began to wreak havoc and possession was ceded by both sides with alarming regularity. With Andrés Iniesta imperious, the Blaugrana looked to dictate, whereas Espanyol preferred to play a long-ball game to Baptistao and hit the visitors on the break. The game sparked into life when Gerard Moreno scored a diving header for the hosts on 65 minutes, Barça unable to clear their lines because of the excess water. It was becoming more difficult to build any sort of rhythm, so Ernesto Valverde’s men had to make do with occasional bursts forward. 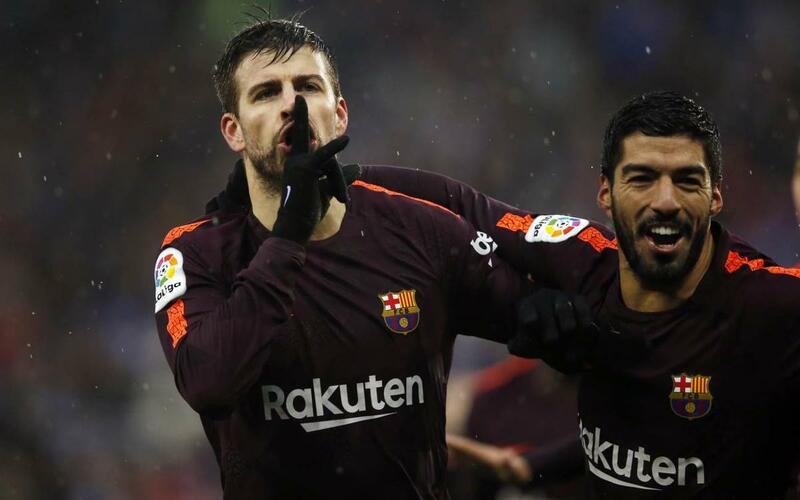 On 82 minutes, Gerard Piqué rose the highest in a congested penalty area to power a header past Diego López from a free-kick. For the remainder of the match, it was Barça in the ascendency, but no further goals saw the points shared. Barça are next in action on Thursday (9.30pm CET) against Valencia in the Copa del Rey semi-final second leg.